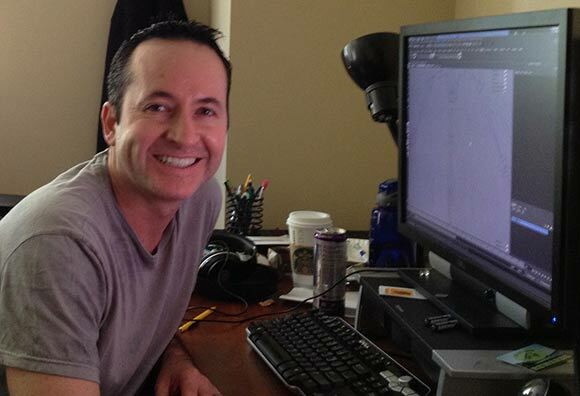 Hello everybody it's me again, Rob Nesler, Art Director on Project Eternity. I had intended on presenting our Art Style document to the world by this update, but it still needs work. So, you have to wait a bit longer for it. So that’s sad. However, with the last art update, I glossed over our Technical Animator Antonio's work 'cause it was 3 o'clock in the morning and I couldn't think about how to describe intelligently what Antonio does for us. Some of you professed extensive knowledge of rigging and skinning, as well as profound disappointment in my patronizing tone, and demanded to be better informed of this horribly complex facet of game development. So...okay! Before that we have some eye candy. And noooooo...you can’t have a larger version. 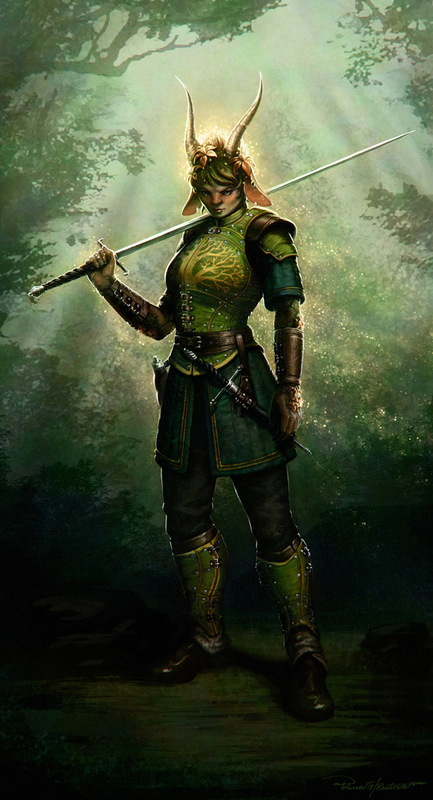 Google "estoc" if you want a sense of the weapon she's holding. Okay back to technical animating. "Antonio Is our Technical Animator. He makes rigs, writes scripts that make rigs, and rigs the rigs. It’s all very technical. You wouldn’t understand. He’s a professional." Some of you wanted more... so... here’s more. His primary responsibility is rigging and weighting characters for skinned forward kinematic and inverse kinematic animation. Daily, he also uses his expert technical knowledge of animation techniques and the underlying idiosyncrasies of 3D animation software to assist our animation team as a problem solver, a mentor, and a scripter to improve animator workflow and overcome deficiencies in the applications we use. So that sounded intelligent; vague and awkward, but intelligent. So, specifically ROB, what does Antonio do that will make Project Trenton/Eternity awesome? NO! Specifically ROB! What the hell does he do??? Okay, okay, for Project Trenton/Eternity Antonio has written, a few, and re-written a couple times the following, and it's all called DNA (Design New Actor). 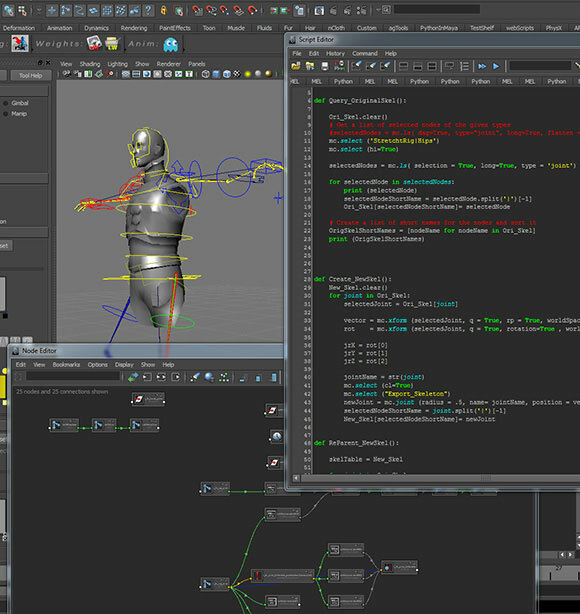 Firstly, there is the Export Rig, and this is not so unique to 3D character animation. This is a highly optimized skeleton that represents only the bones that the actual actor mesh is weighted to. For a humanoid character these bones would be named: Pelvis, Femur_Rt and Femur_Lt., etc. Vertices of the visible textured geometry, that the player sees, are all attached to these bones with various amounts of strength, so the character will appear to bend and flex more naturally. Sometimes these bones will have physics applied to them, like pony tails. 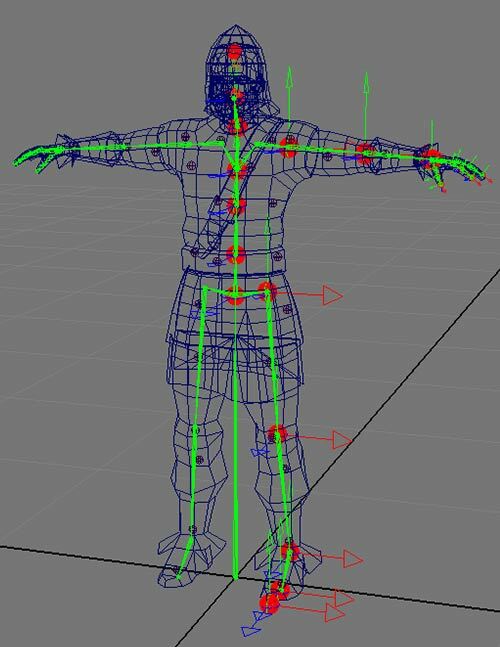 This is less a rig and more of: simply the skeleton that the other rigs interact with, but these are the only bones that go into the game, and we call it the "export rig". Antonio builds this skeletal hierarchy to fit the expected proportions of the character, and character modelers build character meshes to match visible body parts to the locations of bones, so that -- for example -- the bendy part between the upper_arm_rt and lower_arm_rt ends up being where a humanoid creature, as designed, would expect an elbow to be. ...And last, but most certainly not least, we rely on Antonio for creating rigs that provide controllers that allow the animators the maximum amount of flexibility when creating animations. These 'control rigs' are specialized for each character/creature type, after they've been stretched. They provide controls for jumping, crouching, twisting, grabbing, etc. They provide inverse kinematic and forward kinematic transformations, physics blending, following, squeezing, etc.-- whatever is required, actually. These controllers and extra bones are for animator manipulation only; they do not get exported. That's why when I said, "he rigs the rigs" I wasn't actually joking. These are rigs of rigs. These are the animator’s most essential bread and butter. 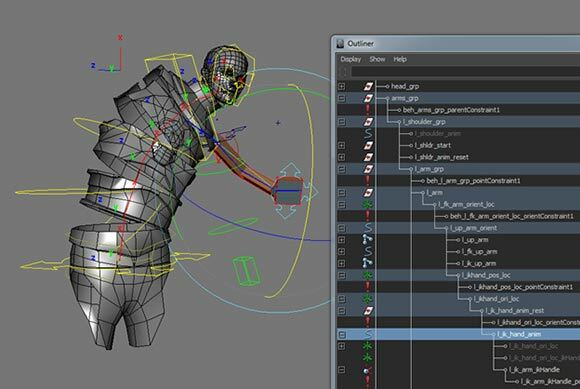 Using these tools is how they actually create character animation. And that's it. The update is over. I know, not so fun, but this is serious stuff. We’ll show some animated examples sometime in the not-too-distant future. It's settled godlike cipher first playthrough. We heard an awful lot about rigs in this update, but nothing about Murtaugh! Puns aside, thanks for the update, and all its technical, technical glory! I'm studying up on 3D game math right now, for I am but a nublet. Your signature made me 'lol' in my office. EARS! And angry horns. I like. 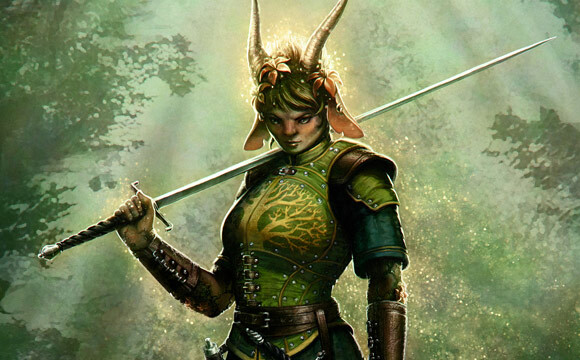 I hope there's significant social/societal disadvantages for choosing a godlike PC race; I mean, being overpowered compared to a regular elf/dwarf/human has to have certain drawbacks, right? Wait! I didn't click the image for the complete version! That is an awesome outfit/armor set. Edited by Ieo, 19 February 2013 - 06:09 PM. I really like the concept of the godlike. I hope Godlikes recieve an XP penalty if they're turbo-boosted like the planetouched of D&D. Are you duplicating all animations across all characters or will you make a few alterations? For instance, it would look a little silly if a tiny dwarf and giant whatever-you-have-that-is-big swings 2h weapons the exact same way. There's only one godlike race for player to choose, correct? Will be possible to player to choose what kind of divine heritage manifestation the godlike race will have? Or the godlike race that the player can choose will be that one from the imagem above? I would like to choose my character "mark", i loved the golden eyes from the NWN2 Aasimar. I like how the ears of the first Godlike are animal-based, yet they also evoke the look of flower petals. It's a good way of reinforcing the nature theme of that particular Godlike from multiple angles. The other three designs seem maybe a bit too extreme, unless that's the point. It's certainly difficult to imagine any of the three having remotely normal lives when their heads constantly look like they'll come apart into fire/water/lightning. I look forward to seeing some Godlike with either subtler, weirder, or less element-based features in the future, but this is a good introduction to them. For a future art update, could you show us something that required lots of experimentation and revision (such as maybe the final design of the Orlans, Aumaua, or Godlike) and show the various iterations and rejected versions, with an explanation of why certain designs were accepted or rejected? I always find that sort of stuff interesting. Nice info and awsome concept art! That was one hot Baphomet chic! Dont mess with her daddy tho! Depends on how pure the water godlike is, since pure water is rather resistant to electrical current, and even if the water godlike wasn't pure water but a conducive solution, the current should pass through--maybe electrocute everything else around them that's wet? Hmmmmmmm. Would love if the godlike concept by Polina was a party NPC being developed. Edited by Ieo, 19 February 2013 - 07:23 PM. So we have fire, water, earth, lightning (air? ), air (talons?). I thought they were going to be "touched" by the pantheon that existed in the world, not by the "elements." (Not that I mind). Unless the pantheon aren't really gods and these guys are touched by "natural gods"... Or it could be that there are these gods (elements) in the pantheon. Great update in either case. Thanks! Keep up the good work. Edited by Hormalakh, 19 February 2013 - 06:46 PM. Throw in a heart one and you've got CAPTAIN PLANET! But, in all seriousness, I think those are just meant to be some examples, and not all examples. I could be wrong, *shrug*. Perhaps, though, the touching isn't limited to elements. I mean, the features he listed weren't elements. Godlike manifest their divine heritage in a variety of ways: wings, horns, strange birthmarks, talons, odd eyes - but they always manifest it somehow. That leads me to believe that elemental aesthetics/themes are simply a handful of options amongst the full set, rather than the four corners of the full set. Haha. Splendid! ^_^. I wish Mastercard really used it as an ad. They could air it during the show. 8P. I bet it'd be excellent PR. Edited by Lephys, 19 February 2013 - 06:55 PM. I guess the godlike... have a little trouble with helms, hmm? Love the artwork, and thank you for the update! Nice update - the mesh scaling point makes a lot of sense budget/schedule-wise. Very neat. Hmmm, godlike... Sounds overpowered, so it's natural that they have some kind of drawback (or not so powerful abilities as we may think). It'd be cool for godlikes to become more "in touch" with their unique traits as they level up, but I'm sure you guys have already thought of that (it's Obsidian after all!!!). Something that I can't possibly stress (and beg) enough for, even though this might not be the best place to do so, is this: PLEASE make dialogue as extremely diverse as it is humanly possible. Especially concerning different races. For example, Baldur's Gate had some good dialogue all around (SoA in particular) but Planescape Torment is what you should aspire to! As a godlike, I'd like to hear unique reactions from ALL members of my race, even if they're negative (I don't know, as far as lore is concerned, whether some godlikes dislike/favor others, e.g. fire vs water etc.). What I mean is, I want to FEEL like a godlike, not just have a couple of different animations and a title on my character sheet. That, of course, goes for all races. Now, I could blabber on about what I want to see in the game, but in all seriousness... I personally have more than high expectations for this game. Project Eternity must be better than Baldur's Gate 2 or Planescape Torment. The bar is set very high.With the creators of so many excellent games,a few million dollars at your disposal and the clear support of all the people in this forum and the Kickstarter funders, Obsidian must deliver the ultimate RPG experience so far.... For anything less than that we have Bethesda and CD Project. First RPG I've been excited for in a long time.